Only 20% of the target audience understand the features of Snapask by browsing the previous landing page. 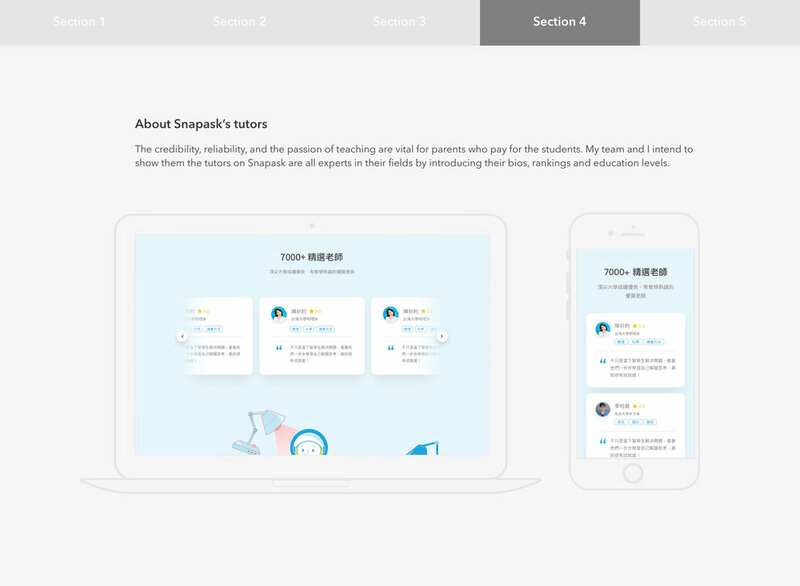 The previous student landing page has very limited ability to either let users know the main functions of Snapask or lead them to the on-boarding process, so my team planned to have a redesign on student landing page after a usability testing. 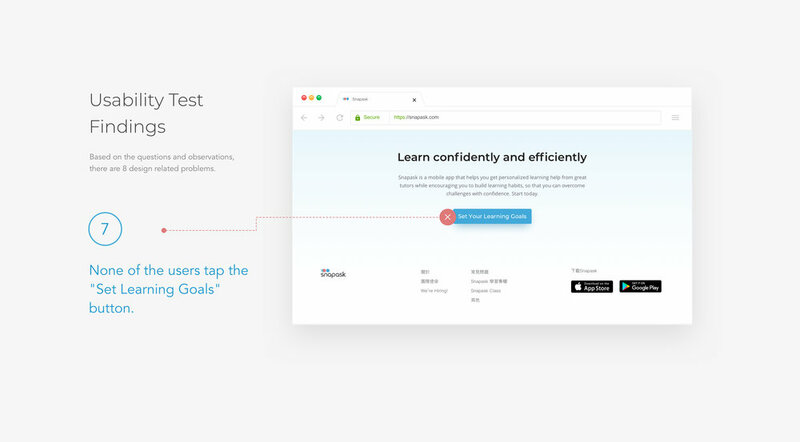 The objective of redesigning and testing on the student landing page is to "help students understand how can Snapask help them achieve their academic goals, and experience the value Snapask can bring them. After the newer version launched with the redesign of on-boarding, the on-boarding dropping rate decreased from 70% to 28%. Before the redesign, I intended to evaluate the usability of the previous landing page design by using the guerrilla UT method. The goal was to validate the user performance and to identify potential design concerns on student page. The results of this research were addressed to improve the efficiency and user satisfaction for the next design iteration. We eventually ran 5 tests with 5 students and each session lasted 30-40 minutes. After the UT, we found out only 20% of the target audience correctly answered what Snapask’s service is by browsing the page. The content tended to mislead the targeted students about the Snapask’s features. The targeted students had difficulties in understanding how Snapask can help them achieve their academic goals. We researched of buyer personae to find out which type of students have a higher chance to purchase Snapask packages as well as in what situation will they use Snapask. The participant screener were set by researchers and data scientists. For high school students who have no access to academic help after school, and doing self-studying without a credible solution to the challenges they’re facing immediately. Snapask offers an online tutorial service which can allow students to connect with over 100000 tutors and ask the questions by snapping a photo of any question so that they can get the solution right away. After the positioning statement was defined. 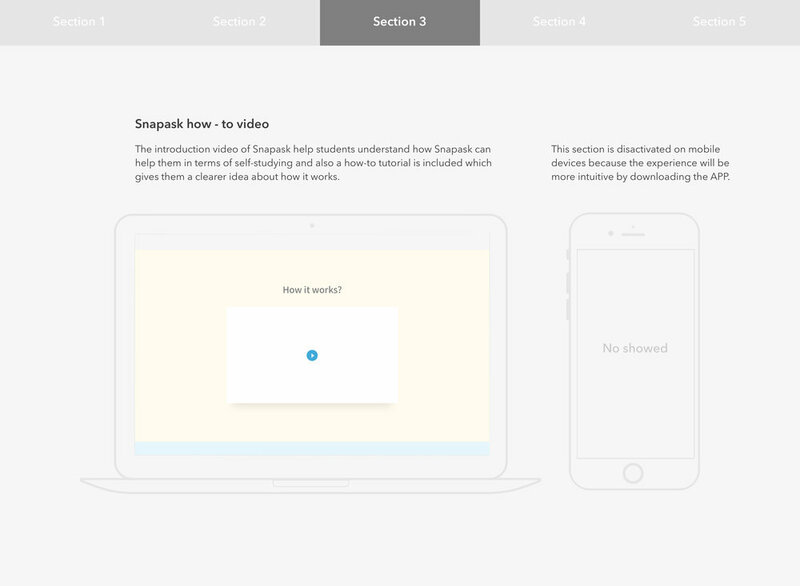 The team refined value proposition to “Snap and get instant 1-on-1 homework help” demonstrated the features of Snapask. 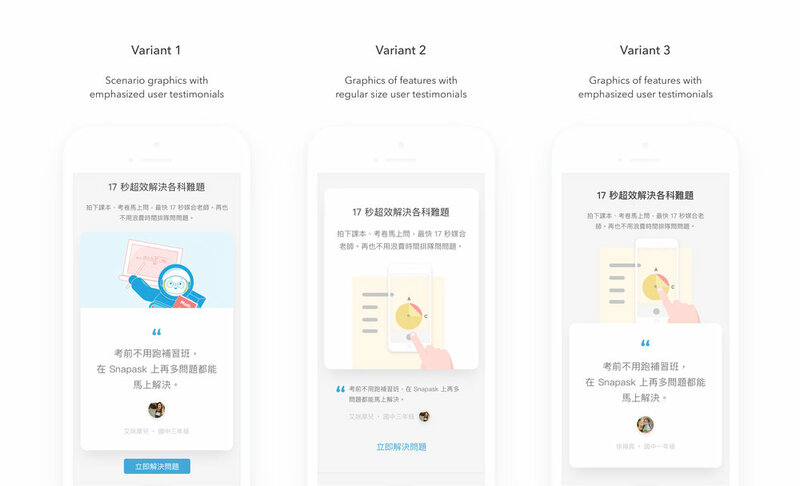 After the wireframing, we made 3 variants and did the rapid user testing to ensure we were delivering the design effectively as our expectation. After the structures were settled, I worked closely with brand designers and created the graphic for the new version of landing page. To intrigue high school students, my team and I evolved the visual language into a more trendy and colorful style. After the newer version launched, the on-boarding dropping rate decreased from 70% to 28%.